On Monday, August 11th, Billy Casper’s World’s Largest Golf Outing benefiting Wounded Warrior Project was held across 120+ courses in 26 states. WLGO is more than just a great day of golf; it’s about making a difference in the lives of our injured service men and women through participation and team fundraising. 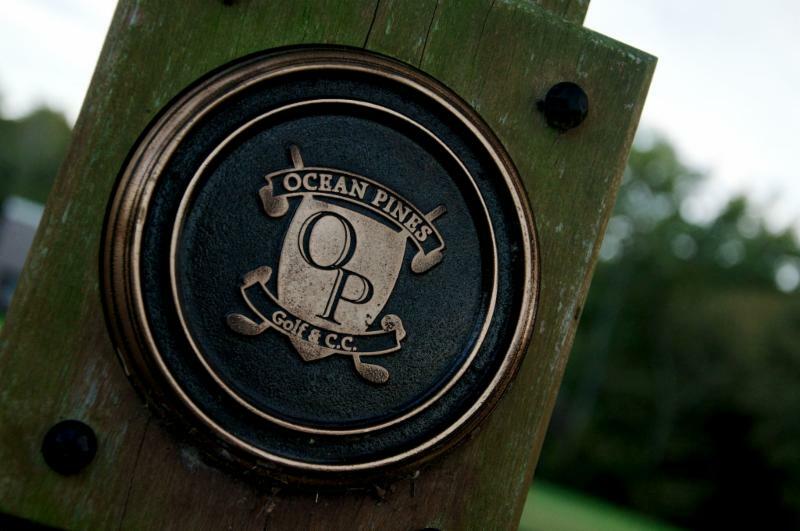 Pictured are the participants who played the Ocean Pines course that day. Team Rider raised the most for a team and the course has raised almost $4,000 total. Lots of fun and for a great cause!! FIRST Family Fun Night! INDOOR POOL! The indoor/outdoor Flea Market welcomes vendors selling gently used clothing, children’s items, household items, collectibles and more. Indoor spaces will be inside the Community Center gymnasium and include an 8′ table and a chair. Outdoor spaces will be the parking lot spaces in front of the Administration Building (bring your own table). 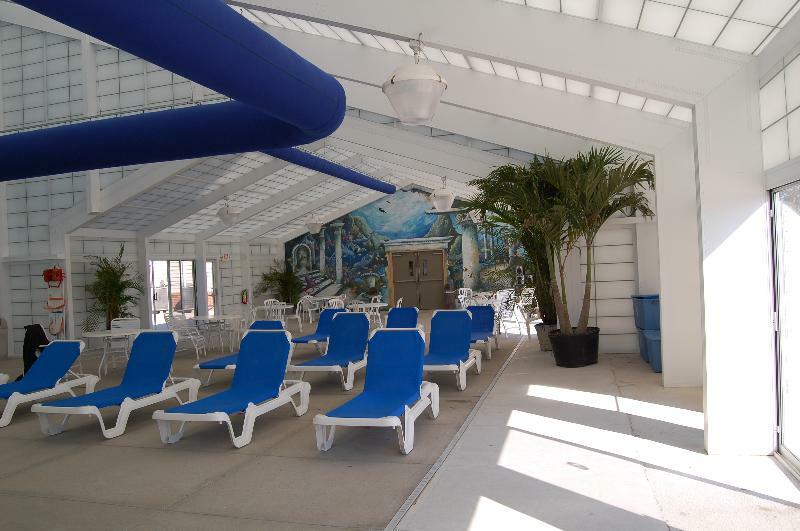 Spaces for Ocean Pines residents are $15 for indoor and $10 for outdoor. Spaces for non-residents are $20 for indoor and $10 for outdoor. Please register by visiting the Ocean Pines Rec. and Park Department or by calling 410-641-7052. Stop at the Tern Grill for Football Sunday Game Food and Drink Specials! Entry fee includes greens fees with cart, range balls, grab-and-go lunch, door prize entry, dinner buffet, awards, prizes and goody bag. Captain’s choice, scramble format. Men’s, ladies’ and mixed teams welcome. Contests include hole-in-one, straightest drive, putting and closest to pin. Sponsorship opportunities are available. Discount applies to rack rate or specified card rate. Cooler Temps. Lower Rates. Enjoyable Play. Mums, Flowering Cabbage, Flowering Kale, Ornamental Peppers, Indian Corn, Gourds, and Pumpkins of every size and shape! The Worcester County Humane Society returns to the Ocean Pines Farmers Market. Join us and support this great organization with your donations! 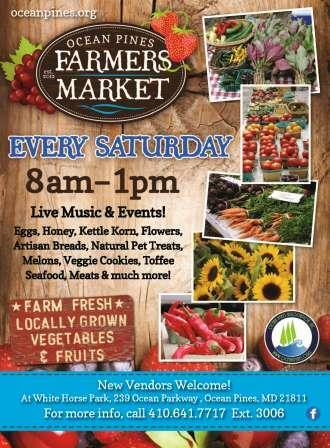 9/27 – Seashell Sweets Retro Confections joins the Ocean Pines Farmers Market on Saturday, September 27th. Gina and Kate bring their converted retro camper to market filled with local-made ice cream, baked goods, old fashion candies, beverages and more. Pumpkin Palooza invades the Kids Market Zone on Saturday, September 27th. Ms. Vicki and her Pumpkin Patch Assistance will be crafting with the children between 9:00 am to 12 noon. Each child will choose a pumpkin and then decorate it with a wide variety of craft materials. This Kids Market Zone activity is open to all children between the ages of 3 to 14. The cost is $6.00 per child. The Kids Market Zone is located next to the Holy Trinity Pantry. Proceeds from this Kids Market Zone activity are being donated to the Holy Trinity Church. All level yoga enthusiast are welcome for this Meet Me At The Market with Kristin Quinn, a 200RYT certified yoga therapist. Release tensions, center yourself and energize with this free Therapeutic Flow session. We’ll gather under the Memorial Pavilion on June 21st at 9:30 am. If you would like to reserve at free mat or if you have any questions, please email Kristin at kquinn@ecyoga.com . open to the public! New Vendors welcome! 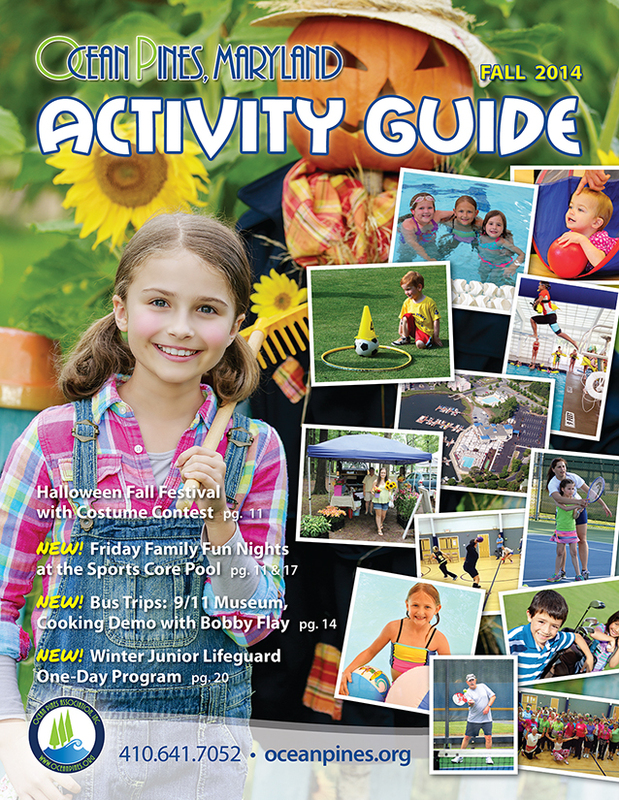 Fall Activity Guide is HERE! Fall Indoor / Outdoor Flea Market Sat, Sept. 27th 8am – Noon Vendors Wanted. 410-641-7052 or email rec@oceanpines.org Stop in today for a copy or click to download! CLICK HERE FOR NEW FALL MENU! JOIN US FOR SUNDAY FOOTBALL SPECIALS!! Lunch & Dinner Specials Wed – Sunday, New Menu NOW! Manklin Meadows Racquet Complex Happenings! 3 Racquet Sports Now Offered! Residents can play all 3 and Save $! Season Closing Meeting at the Tennis Facility:Sunday, Sept 28, 2014 1:00 PM. Oct. 11, 2014 – The James City County Parks & Recreation Fall Tournament October 11, 2014. The competition has always been first rate, and October is a great time of year to visit the area. Oct. 9 & Nov 18. Reserve Space at Rec Center 410-641-7052 or email rec@oceanpines.org for info – these will sell out fast!! SIGN UP NOW FOR BUS TRIP TO WASHINGTON, DC FOR THE 2014 METROPOLOITAN COOKING AND ENTERTAINING SHOW & COOKING DEMO WITH BOBBY FLAY! Join us to see an in-person celebrity chef demonstration by Bobby Flay. All proceeds from this car show will be donated to the Breast Cancer Society. Winners will be chosen by spectator votes for most popular vehicle. Cars, trucks and bikes are eligible for entry. Hot dogs, chips, water, baked goods, and breast cancer merchandise will be available for a small donation. 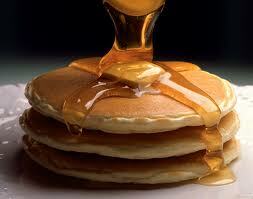 To donate baked goods, please contact Tom Johnson at 410-208-3811. Mary Henderson, coordinator for Worcester County, will discuss Women Supporting Women at this monthly meeting. Light refreshments will be served and a 50/50 raffle will be held. For more information, contact Dianna Bolyard at 410-208-9326 or diannabolyard@aol.com. Join the Ocean Pines Association, Atlantic General Hospital and Peninsula Regional Medical Center at this free community event. Free screenings will be offered, including blood pressure, bone density, flu shots, foot screening, hearing screening, skin cancer screening, stroke assessment, pulse oximetry and dermascan. Other screenings and health-related information, including exercise, nutrition and life safety, will also be available. Call 410-641-7052 for more information. 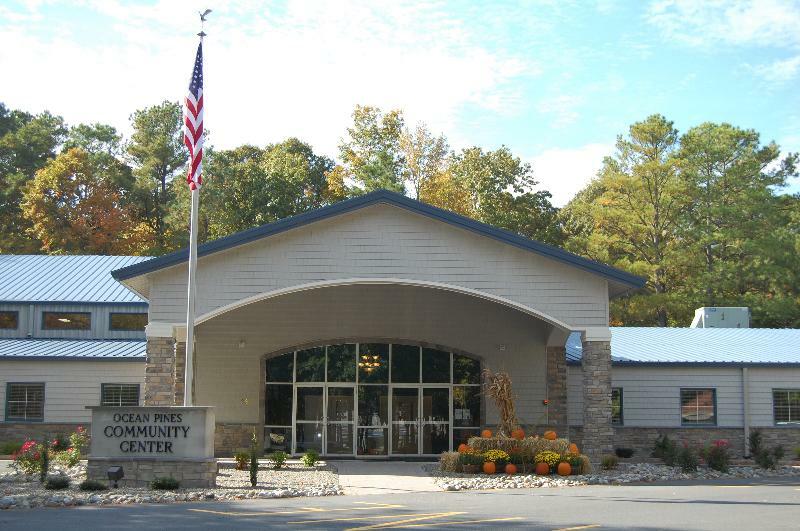 County Commissioner Judy Boggs will discuss current county issues that impact Ocean Pines and northern Worcester County at her final town meeting. Topics include current and future construction projects in the area, the progress of natural gas availability in the county, the latest news regarding the Ocean Downs Casino and Racetrack and more. All are invited to attend and participate in the discussions. For more information, call 410-641-6158. The guest speaker at this monthly meeting will be Julie Rayne, Worcester County Health Department, who will discuss depression. Members and their guests are welcome to attend. For more information, contact Larry Walton at 443-831-1791 or lrwalto@yahoo.com. A plant and recipe swap will be held at this monthly meeting. Call Gail Jankowski at 410-208-3470 for more information. Tickets are available at the door or in advance by calling 410-208-6719. Carryout is also available. Scramble-Captain’s Choice format. Prizes, including a new Cadillac SRX, will be available on all par 3s. Other prizes include Low Gross, Low Net, Longest Drive and Closest to the Pin. Dinner to follow. All proceeds will be sent to the Chaplain’s Office in Landstuhl, Germany and the Veterans Support Centers of America in Quantico, Md. Sponsorship opportunities are available. Registration deadline is October 5. Call Ben Dawson at 410-603-2205 for more information. The Gems’ Tea celebrates the lives of local women who have contributed to the quality of life in Worcester County over the years. This year’s honorees are Patricia Dufendach, Berlin; Suzanne Hurley, Ocean City; Laura Morrison, Pocomoke City; Janet Simpson, Snow Hill and Mary Yenney, Ocean Pines. The honorees will share their life experiences in personal interviews with a videographer; these contributions become a documentary of women in Worcester County viewable at each Worcester County Library branch. For reservations, please mail checks made payable to FWCCW to PO Box 1422, Berlin, MD 21811 by October 14. For more information, call Kay Hickman at 410-600-0552. Entry fee includes greens fees with cart, range balls, grab-and-go lunch, door prize entry, dinner buffet, awards, prizes and goody bag. Captain’s choice, scramble format. Men’s, ladies’ and mixed teams welcome. Contests include hole-in-one, straightest drive, putting and closest to pin. Sponsorship opportunities are available. For additional information, please contact Marie Gilmore at 410-208-6612 or OPMarie@aol.com. This entry was posted in Community News, Press Releases by Teresa. Bookmark the permalink.